I love the idea of a groom’s cake – a fun and delicious dessert that reflects your groom’s personality or is inspired by his hobbies. And yes, every time I think about a groom’s cake I’m reminded of the red velvet armadillo cake with gray icing from the 80s hit movie Steel Magnolias. However, today we’re talking about a visually pleasing, fun groom’s cake! One of the best things about visiting the coast – and staying in a beach house – has to be a clambake (or steamer pot). And today’s cake is a perfectly sweet version of that! 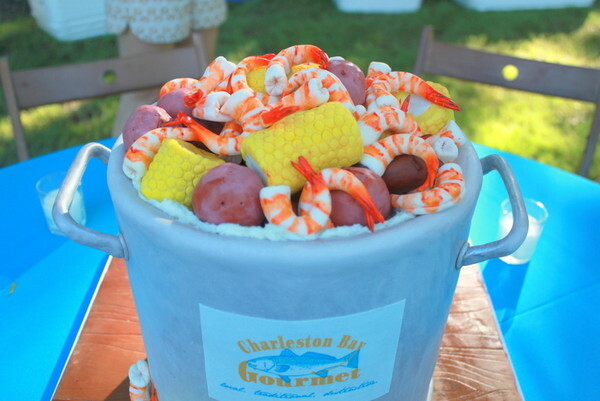 The corn, shrimp, and potatoes look so real and good enough to eat! You’ll find this unique and fun groom’s cake here. It was created by Delicious Desserts.